So the day is here! Your vehicle goes to another eBayer and their cash comes to you. At least, that's how it's meant to turn out. Here are the things that you need to attend to (and the order in which you need to do them) to ensure that this is exactly how things go. Be very careful about deviating from this list; in most cases, the result will be trouble (or worse). Require Promptness: A favorite tactic of scammers is to keep a seller waiting, arriving just too late to do things like visiting a bank branch for proper payment to be carried out. Don't fall for this; if your buyer is a no-show at the appointed time, contact them and reschedule. Stick to Your Guns About Terms: It bears repeating here: don't vary from the agreed-upon transaction itinerary. Introducing disorder or last-minute changes is the favorite way for scammers to confuse you just long enough to get away with your vehicle and leave you with nothing. Whatever your policy on checks, never accept a check for more than the purchase amount and send the buyer away with both the vehicle and the difference in cash. This is a sure sign that the check will eventually bounce and you'll be out not only one vehicle but some cash as well, just to add insult to injury. Be organized and stern, though also friendly, and stick to your guns about terms. Stay in the Vehicle for Test Drives: Don't let the buyer drive the vehicle or hold the keys without your already being in the passenger seat. Secure Payment: Before paperwork or vehicle transit happens, get paid for the balance on the vehicle according to the terms outlined in your listing and make sure it clears. If escrow is involved, be sure that it's eBay-approved, since most non-eBay-approved escrow sites are fakes, even if they display the eBay logo. Better is a required visit to a bank branch with your buyer and either the deposit of a cash payment from them or having them remit payment to you by a bank transfer. Remember that even cash can be counterfeited, so requiring that a deposit is made into your account before the payment can be complete is good policy, keeping in mind that this should be done with a human teller (who is equipped to detect counterfeits) and not an ATM (which is not). Get a Photocopy of Their Drivers' License: This is good proof that you have met them and delivered the vehicle as advertised and provides identification in case they do something immediately after the sale with their new vehicle that brings the authorities looking for you based on previous ownership records. Don't sell a car to someone without a drivers' license, since you could be held liable if they drive it away and get into mischief. Remove Your Plates: Before completing the bill of sale or signing over the title, remove your license plates from the vehicle. Never let any amount of buyer protest prevent you from doing this; it is their responsibility to ensure that the vehicle is street-legal and to have the necessary temporary paperwork in place before they arrive to purchase the vehicle. Sign the Bill of Sale: Have the buyer complete the bill of sale, providing evidence that the vehicle has changed ownership and acknowledgment by both parties that responsibility for the vehicle now rests with the buyer, not with the seller. Sign the Title: Complete the transfer of ownership portion of the car title, filling out information carefully and correctly. 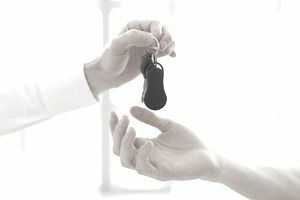 Once the title has been signed, hand it over to the buyer and the sale is officially complete: they have remitted payment, provided an acknowledgment that they intend to take responsibility for the vehicle, and accepted the signed title. Tie up Any Loose Ends: If you've promised maintenance records for the vehicle in your item description, remember to hand them over to the buyer. Also hand over owner's manuals, keys, key fobs, forgotten accessories, or anything else that ought to go with the vehicle. Call your insurance policy provider and notify them that you no longer own or drive the vehicle and that coverage should be terminated at the earliest possible opportunity. Shake Hands and Thank Your Buyer for Their Purchase: Even for a one-time sale, good customer service can go a long way toward minimizing the impact of any issues that pop up in the immediate aftermath of the sale. If you meet your buyer in person, give them a personal touch. Ask for and Leave Feedback: If the sale went well, be sure to ask your buyer for positive feedback specifically mentioning a car sale and leave them the same in kind, since both of these will be strong feedback assets for future transactions. Though it's a longer, more complex, and more fraught process than selling other things on eBay, most of the complexity is just a result of the vehicle selling process as it would occur no matter where you'd sold your vehicle. In all likelihood, you've also gained by selling the vehicle for more than you could have received in a local sale. Congratulations! You've just sold your vehicle on eBay!